My first ever competition win! I was thrilled to discover yesterday that I had won the Cockermouth Crime Writing competition. The winner was announced at the Kirkgate arts centre in Cockermouth during a performance by the judge Mark Billingham and the band My Darling Clementine. Unfortunately I couldn’t attend despite being offered free tickets. However, I had not heard anything from the organisers so assumed that I had not been successful. 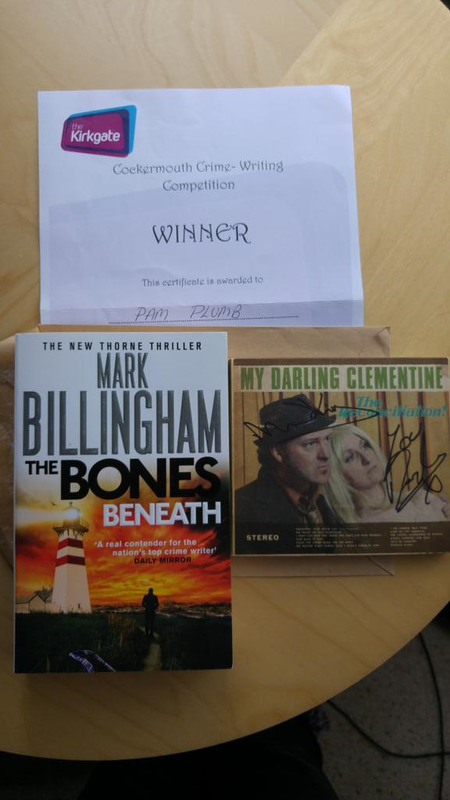 But yesterday I collected a parcel from the post office which contained a signed copy of Mark Billingham’s latest novel, a signed CD by the band and a further two free tickets for the Kirkgate! What has made it so special is that it was judged by Mark Billingham and he thought my story was ‘gripping and intriguing’. This kind of recognition – from a major crime author- is so amazing and really gives me confidence that my writing is getting to a better standard – certainly in this case. It is such a great incentive to keep writing even when I can’t be bothered or think that something I’ve written is pure drivel. It has taken me about four years to win a competition. I’ve been placed second before now for my story in Seaglass and Other Stories and had several pieces published, but it’s not the same as having actually won something. Up till now by greatest achievement is probably being longlisted in the Bristol Short Story competition. Many, many more times I have had stories rejected for publication or just not placed. As a new author, it’s so hard not to keep looking out for the results and thereby not working on something new. I am learning to ‘forget’ about a competition or submission and, although hopeful every time, I’m not hanging my hat on every one like I used to. That way the disappointment is limited and the surprise of success is even greater! This entry was posted in Uncategorized and tagged competition, crime, Kirkgate, Mark Billingham, perserverance, short story, story, winning, writing on October 11, 2015 by pamjplumb. I’m really pleased that I have a story included as part of the Brighton Digital Festival on the Geo-writing website. The project relies on the public to take a given prompt in a given location and write a story of up to 300 words. By visiting the website, http://www.geo-writing.com/index.php you can get a prompt, submit your story and then read other stories from all over the place, such as Cambridge, London, Scotland and New York. Prompts are available for a variety of locations across the globe so anyone can take part! Why not have a go? This entry was posted in Uncategorized and tagged creative, flash fiction, fun, publications, story on September 8, 2014 by pamjplumb. I had great fun last Friday taking part in the weekly @FlashFridayFic competition properly for the first time. I had a go a short while ago but was not able to follow up as a reader. This time I had the luxury of time and was able to both submit a story and to read the other entries and comment on them. That’s what makes the competition so much fun! Each week the organiser Rebekah Postupak posts a photographic prompt then the writers get writing. The word limit is 150 words with 10 per cent leeway. It’s amazing that so many great stories come out of so few words and so quickly. Submissions are only allowed on the Friday based on Washington DC time. Guest judges preside and choose a winner which is announced on the following Sunday. There is such a variety of writing and takes on the prompt which also makes being a reader fun, although it’s great to have an opportunity to see your own work up there too. And you will be made to feel most welcome – enjoy! This entry was posted in Uncategorized and tagged creative, flash fiction, fun, story, writing on August 3, 2014 by pamjplumb. This entry was posted in Uncategorized and tagged #Writein, National Flash Fiction Day, story on June 21, 2014 by pamjplumb. It’s National Flash Fiction Day and there are already loads of fantastic stories on the flash flood site http://nblo.gs/XQhD8 for you to enjoy. My story Game Changer will appear on the site around 6pm BST. 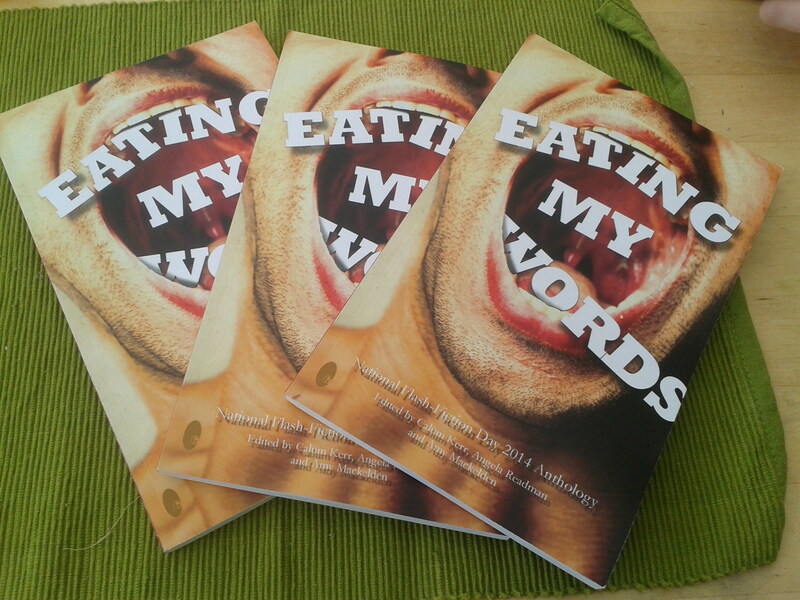 As I have already mentioned in previous posts, my story Seven Breaths is included in this year’s NFFD Anthology, Eating My Words. As part of the celebrations this and previous KIndle issues of the Anthology are available either free or at a reduced price for today only on Amazon. The creator of NFFD, Calum Kerr, also has several of his own books available on Kindle too. There is so much going on and such a variety of stories that there must be something for everyone – so enjoy NFFD whether you are just a reader or want to get involved too. This entry was posted in Uncategorized and tagged flash stories, National Flash Fiction Day, story, writing on June 21, 2014 by pamjplumb.